I'm rather thrilled to be building my first ever LEGO commission. 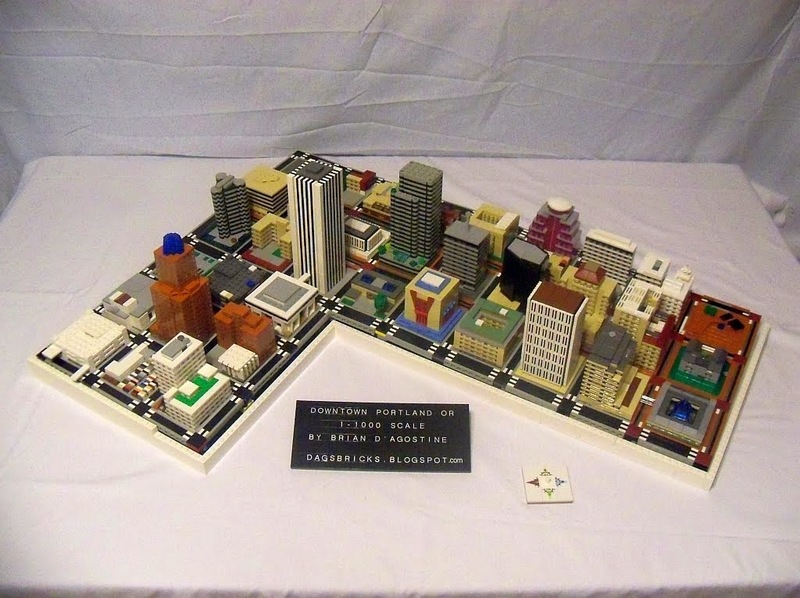 The news coverage on my 1:1000 scale downtown Portland garnered some local attention. 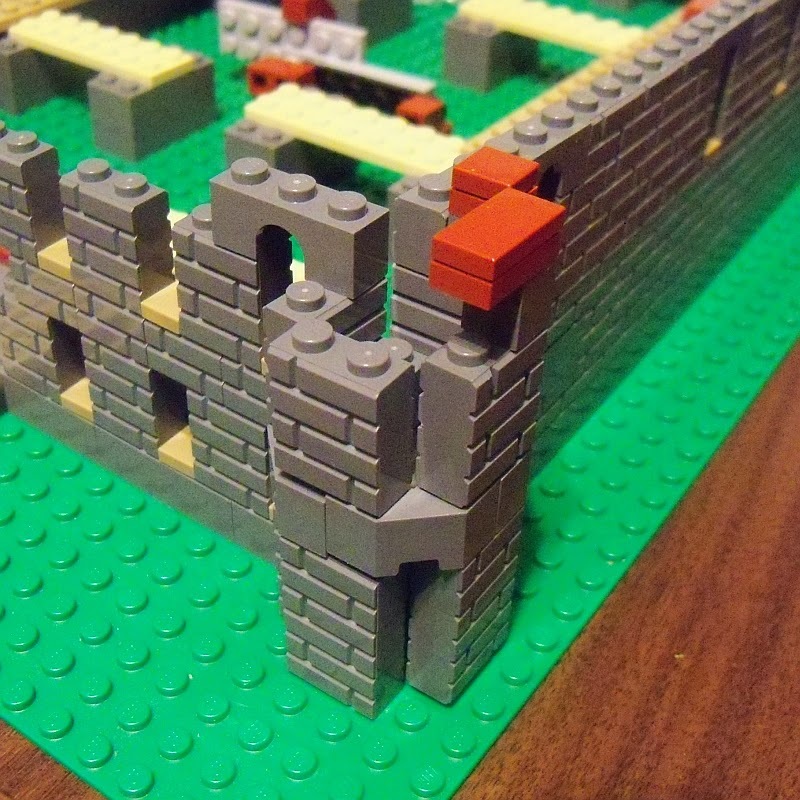 I'm recreating an historic armory building at about 1:132 scale. Thankfully it's a ton of dark bley brick bricks and a ton of dark red bricks. However there are some areas where a part in dark red would have been perfect - if it existed. In these cases I've had to take some liberties in recreating the feature. I'm more likely to make it look like the original as much as possible. So when I discovered that TLG made no 2x2 facet brick in dark red, I took to the catalog. Searching in just dark red, I needed to find something with a 45° angle. The best I could come up with were the slopes. There's a regular and inverted version. I decided the studs on the regular version wouldn't look quite right but the anti studs of the inverted ones might sort of kind of look like some of the little windows. Four studs wide is equivalent to ten plates of thickness. The slopes are each three plates leaving four plates in the middle to take up the slack. At first thought this was a problem. The two studs wide of the edge of the octagon would be five plates wide. Is this really going to work? Ah, but remember that the lip of the slopes are one half plate thick. Two of these add up to the elusive fifth plate. The whole assembly needed to replicate an octagon within a 4x4 square. There's going to be some studs facing each other here and in very tight quarters. I looked around at some tried and true methods and remembered the "slim jim" method using older 1x technic plates. With a little modification this looked about right. Next week (hopefully): How to fill in the gap between the top and bottom slopes? Roof slopes (or Roof Tiles according to TLG) are a lot of fun to play with. As a home designer by day, I enjoy working out dramatic roof layouts as simply as possible. I prefer simple roofs but sometimes a little flair is needed. The same can be said for LEGO architecture. I like the 25° (AKA 33°) slopes as they are similar to a 6:12 roof pitch but the amount of parts is very lacking. We've got several widths of straight slopes, a hip (outside) slope, and a valley (inside) slope that is seriously lacking in color choices. There are also a couple of caps to finish off the ridge. But you can't intersect two ridges. Or run a ridge into a slope. Or cap a hip. The 45° slopes are much more diverse. 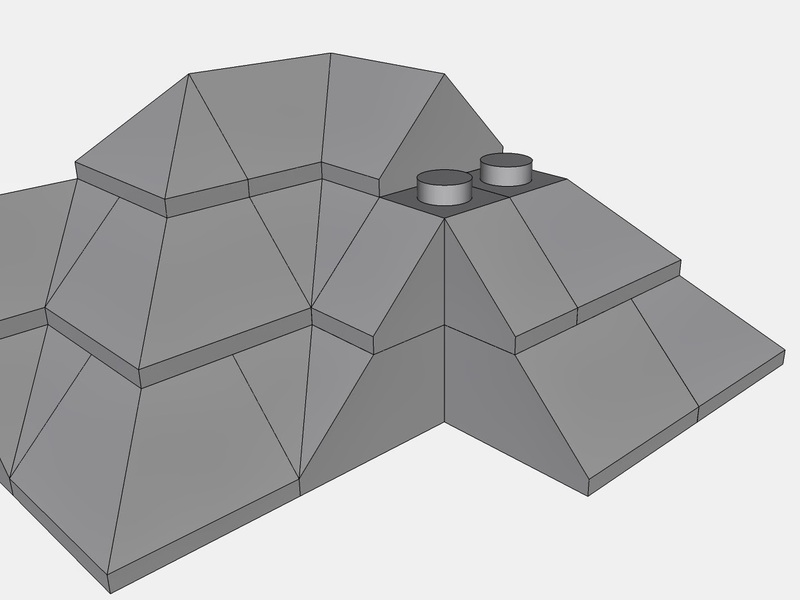 As well as several widths of straight slopes, there are enough auxiliary bits to make a respectable roof. You can do a true hip cap (think pyramid) or run a lower ridge into a roof slope or have a ridge that turns a 90° angle. My only beef with the 45° slopes is that this replicates a 12:12 roof pitch which is generally reserved for older homes, specifically Victorian or Tudor. The 12:12 is uncommon on newer homes. I guess that's just a good reason to do some classic homes with LEGO pieces, right? Turns out, I've been working on a Micropolis scale Victorian home. I started with the roof to make sure that part would turn out right. There were four specific shapes I wanted to incorporate. The first was a hip roof overall. The second was to have an 'L' along the ridge. The third was to have a minor gable on one end. And the fourth, of course, was a turret or spire. Here's my digital mockup which I'm quite pleased with. All my features are incorporated. I've noted the elements for you non-roofy type people. There are a few minor quirks in the design but it's otherwise straightforward. I started by sketching out the basic hip shape before adding the gable end. That required 2 piece swaps to turn that portion of the slope vertical. Rather than mess around with the next level up, I capped the gable end with a 3049. This is a 1x2 double slope (ridge) with a little pointy inverted portion on it. The pointy bit is specifically designed to sit flush over slopes. On the back side I ran into a temporary issue with the ridge turning the corner. There used to be a piece (called 962 in Ldraw) that was made specifically for this application. However it was last made in 1969. For a buck I could have a used one. But I don't want a red or blue roof. There are no other options. I'm guessing that this part was discontinued due to it's uselessness. There's nothing it could do that two other pieces couldn't achieve. While it's always nice to have variety in pieces, sometimes the purple area of the Venn diagram is not cooperation but redundancy. In my case the solution was easy. One ridge was built as usual with the triple slope hip piece 3048. Then the other ridge started by capping the first ridge with a 3049. Both ridges were finished with the same triple slope. From a house building perspective, this looks like tack-on to me. 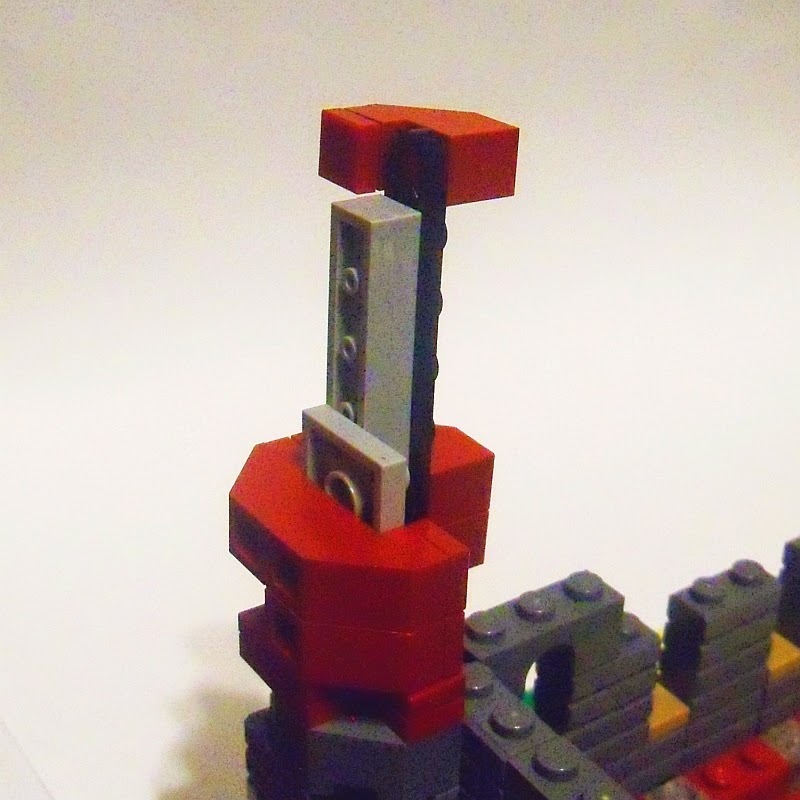 But I guess when building with LEGO pieces, strict structural rules are not always necessary. But one issue remained. 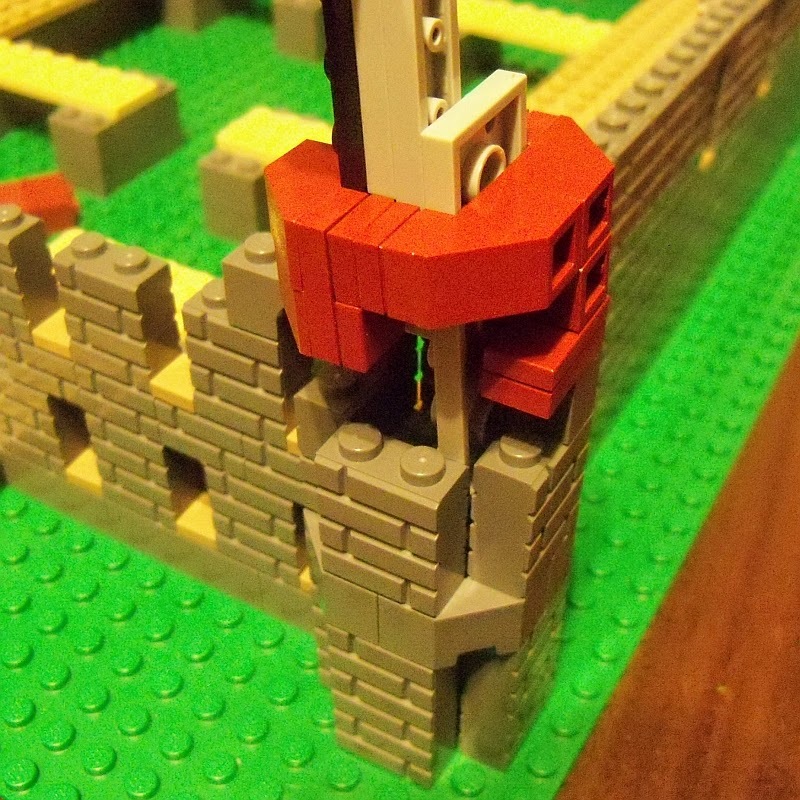 I needed a notch for the turret/spire/rocket ship to fit through. For this, I could not find an extant solution. There are some parts that come close. 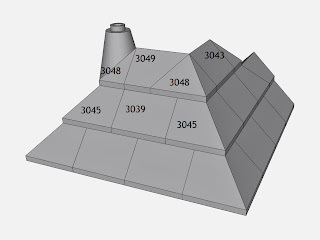 The 3045 would be the part that would normally fit. But I need that corner gone. There's a newer 13548 that is somewhat faceted but it still does not eliminate the corner entirely. Best bet is a 1x2 slope in one direction and fake the other side with a cheese slope. Instead, I decided that something MUST be done about this gap in the canon. A new piece was in order. But much like the forgotten ridge corner, there's no use creating a piece that only has a very specific application. So we need to take an existing piece and make a mate that will not only fulfill my needs but many others as well. I thought it was such a good idea that I put it on Cuusoo. *Edit: Cuusoo no longer accepts new parts submissions and has removed all existing ones. Guess I'll keep dreaming. If you don't follow Caperberry's New Elementary, you should. He posts about new elements that are being released. Of special interest are the new molds or designs. He recently highlighted the new A-frame plate that will be in the upcoming Ninjago sets. This piece will allow for a rigid 45° angle without the hinge pivot that would otherwise get in the way. We've got a smattering of rigid 30° connections, but very little that is adequate at 45°. This will be a fun new piece. 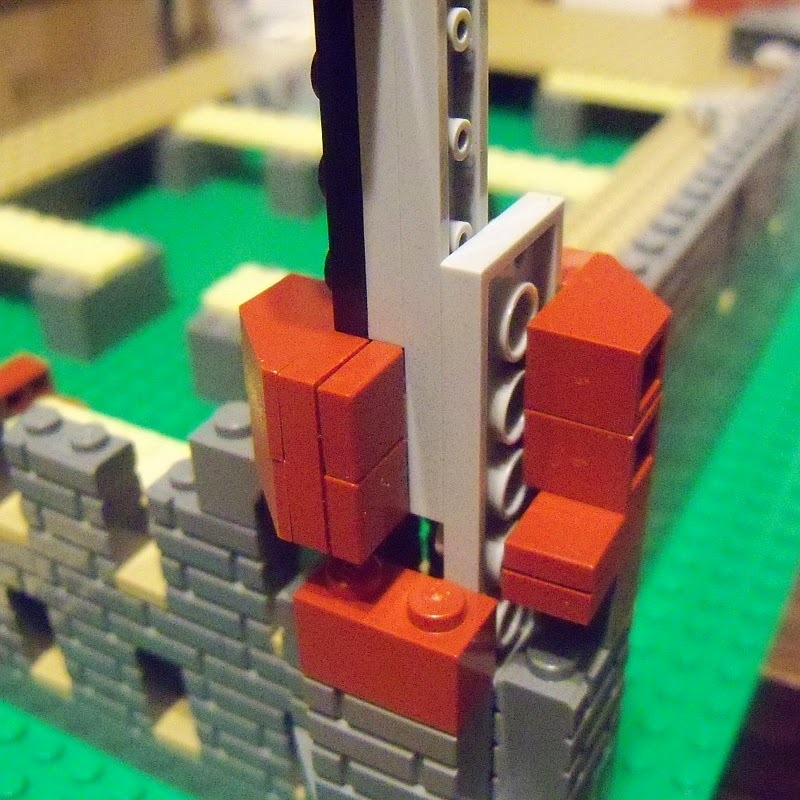 The 1x2-1x2 plate and brick hinges have a distinct advantage though. They can be made to swivel in any angle from 0 to 180°. But for their multi-lingual advantage, they suffer one problem. The pivot can often get in the way structurally or aesthetically. And not just on one side but on both sides of the hinge. On small builds, there's not much to do about it. But there is a way to lock plates together and achieve angles. A while ago I posted some brick built solutions for an equilateral triangle. I'm going to open up that can of worms (Pandora's box?) 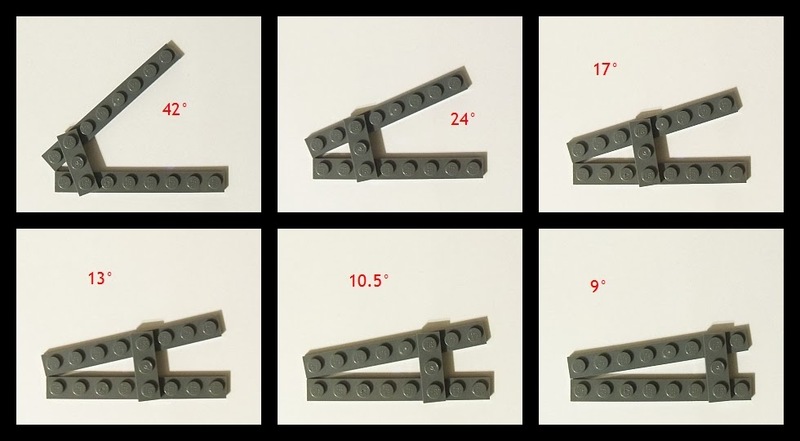 and look at some of the other simple ways to create brick built angles. The premise is this; touch two 1x8 plates at their corners. Then take a 1x3 plate and attach at each set of points going out. By the time you get to stud 7 and 8, there's not much difference in the created angle. The result is the same as using a plate hinge, just without the pivot. The problem with this construct is that the two studs closest to the origin are still a touch more than 2 studs wide. So it cannot effectively be connected. The better solution would be to use 1x8 technic plates. These should be a staple of any MOCers collection anyway. Since a system and technic 1x8 would be so close in angle, I chose not to feature both. You can see though how to achieve some different angles with this technique. But notice how quickly the angles drop at first before tapering to a slow crawl. This is a good visual example of a hyperbola. If you were setting out to create a circle, the only useful one would be the last one. The rest of them don't evenly divide into 360°. If you've seen my slope and wedge charts, you can see how these might be useful in conjunction with those pieces. Of course there are many more uses to these than making large circles. I imagine wings or gangways with jogs in them. There are a plethora of other options as well. You could run this exercise with a 1x4 plate instead of a 1x3 as the spacer. Or you could lock the 1x3 plate on the number 1 studs and use a 1x4 for the angler. Or a 1x6. Or do all that further out on a 1x12. I suppose someone could create a whole matrix of possibilities, or possibly a little GUI script that will calculate it all out for you. Let me know when you're done with that, Ace. I'm headed to bed. A few weeks ago I made my slopes chart available which gives various angles of slopes depending on how you use them. Very closely related to the slopes are the wedges. Sideways slopes, if you will. Though I'm sure many of you have figured out how to use these two together I thought it would be beneficial to have a chart of wedge angles as well. There are fewer wedge instances than slopes so this chart is a bit smaller. At the bottom are three compound angle wedge plates. In the notes section are listed the slopes that this angle is closest to. There are several compound angle brick wedges which I chose not to include. 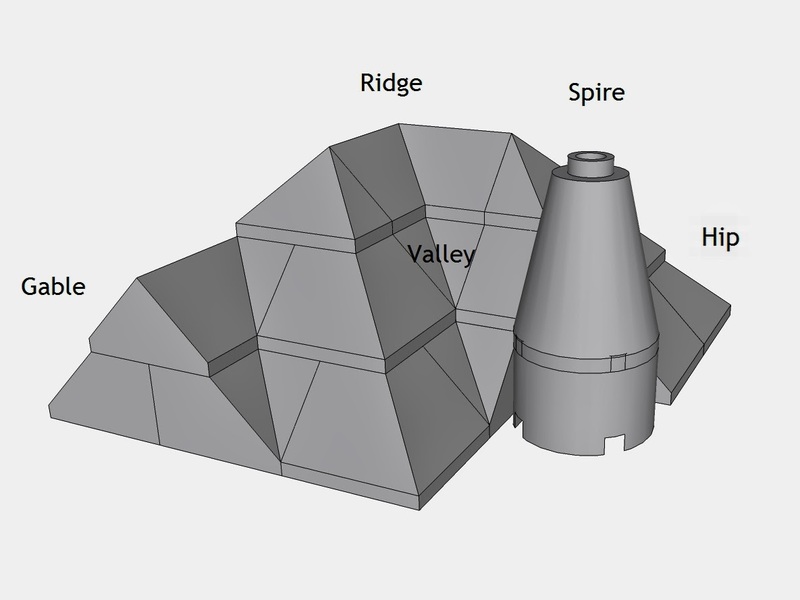 These are listed on Bricklink with their inherent angles and in many cases they are just complicated slopes that got listed otherwise. As with the slopes, if you would like a particular part included here, let me know in the comments. See the wedge slopes chart here. One of the more prominent family parts in the LEGO catalog are the Slopes. There's single and compound slopes, double slopes, squared cones, and inverted slopes. Then there're cousins to the slopes such as windscreens. There are even a few black sheep in other families who have slope qualities. Slopes have a name and a degree of slope but there are really two different numbers. Almost all slopes have a half plate lip at the end. Therefore the slope when stacked is actually a few points off. There's even one slope who must be undercover since it's name is not the same as it's inherent or stacked slope. I've seen many resources on the web where families of LEGO parts are treated and explored. I've not seen one for slopes. 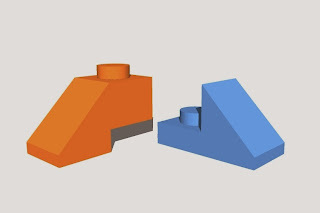 Below is a link you can use to explore a chart that shows each type of slope, it's Bricklink name, assumed slope, actual slope, stacked slope (where applicable) and SNOT slope. There is a link to each part as well. 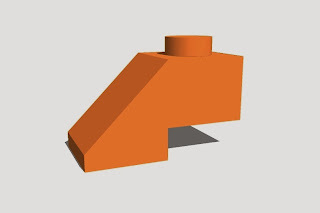 The SNOT slope is what happens when the part is attached sideways. This technique allows for a few more slope angle options. Since this resource is a dynamic spreadsheet you are more than welcome to request other related parts, another data column, or whatever fancies you. As it changes I hope this resource will become more and more useful. You may have also noticed that this is Slopes Part 1. What could possibly be in store for part 2?